I went back to the same spot that we were at yesterday. Arriving right around 6:30, later than we had hoped, we were lucky that the temperature had not dropped much and we could kick our old holes back open. Still mostly dark, the fish were pounding. It was the magic hour that only lasted 45 minutes. As we worked our way through the day old holes, we found fish in most of them. In a good hole we would pull three fish but in a few random holes there was double or triple that! 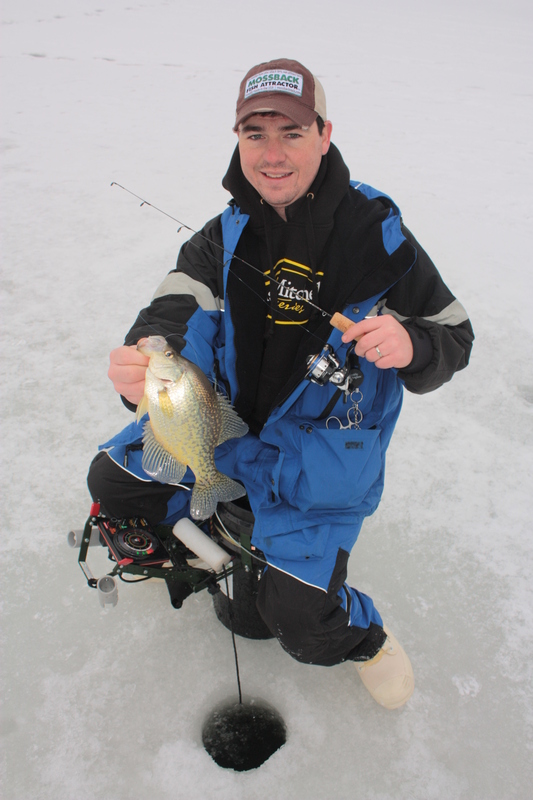 The crappie were very aggressive; charging the bait as it was worked down the water column. Most fish came from 3.5′ below the ice with no relation to weeds present. They weren’t picky about what they fed on as long as it was moving. The feeding frenzy concluded when the bluegill started to move up in the water column and the crappie moved out. Throughout the middle of the day, we moved around a lot checking out new spots. It seemed like everywhere we moved there was fish that were on the move. We would punch holes, catch fish for half an hour, then have nothing. It went this way up until about 3:30. 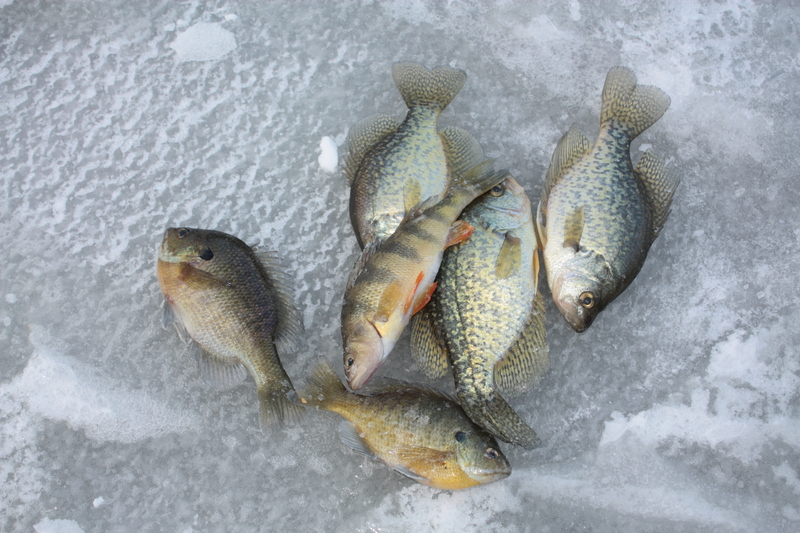 Mid day, we caught crappie, perch, and pumpkinseed in deeper water. 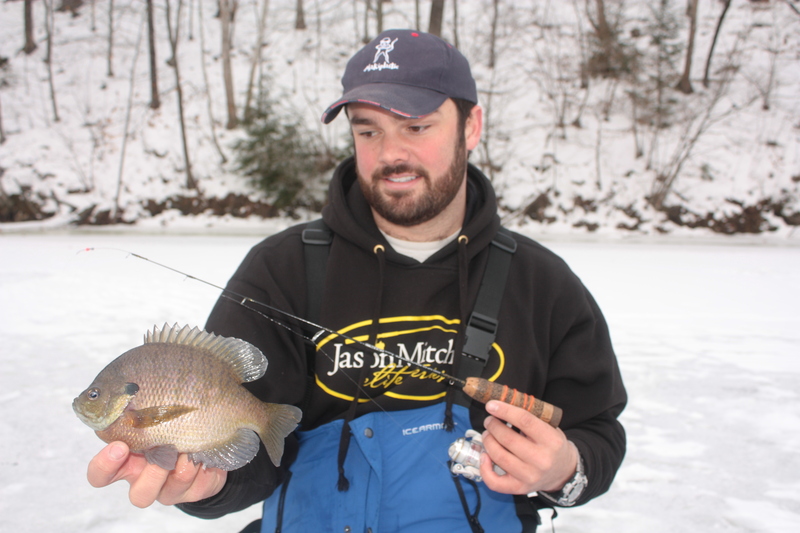 When the water got shallower (4-5′), bluegill were the main fish holding up in the thick weeds. Not understanding their movements, we went back to the area we had caught the crappie in the morning. About the time the sun started to set, the action picked back up. The crappie started charging 3-4 feet to intercept whatever we put in front of them. We could do nothing wrong again! Working our way through a long stretch of holes paralleling a weed edge we eventually found the end of the crappie and started catching only bluegill. We turned around to work back through the crappie section. At this point it seemed that the crappie disappeared mostly and not bull bluegill were the only fish around. The bluegill were hungry and aggressive. There was no issue reading the fish movement vertically in the dense weeds! It was a great way to end two long days ice fishing! Check out Busy Day On The Ice on our YouTube page for more action! We’ve all had the days when we arrive at our favorite fishing spot and realize that we have it all to ourselves, on this day that wouldn’t be the case. We arrived at one of our favorite spots greeted by calm skies with little to no breeze and temps in the 20’s, perfect day to be on the ice. Unfortunately, the recent cold temperatures had given the tip up fishermen enough confidence to haul out the hard sides and set up shop for the season. A few members of our group were able to arrive at day break and punched out an area as a way of “claiming” a spot. The morning bite was hot, everything was right, the water was coming in, we had overcast skies, fish were active. We spent the first couple of hours chasing the school’s of pumpkinseed, bluegill, and crappie along the edge of the main channel adjacent to the thickest weed line. Early ice at it’s best however; Early ice also means everybody and their brother is itching to get out. The amount of tip ups in the ice was off the charts. This is not a big setback and every inch of the channel was spoken for. We were not able to fish our spots the way we normally would have. A lot of people also brought on another dilemma. Noise. Once the morning had gone and the activity picked up we noticed that the fish were gone, well at least we thought so, we actually ended up learning a lot about this particular spot on this day. We found that instead of running to deeper water when levels dropped and noise picked up, that the fish actually moved shallow and found the thickest weed patches to surround themselves with. This made it a little more difficult using the electronic but we were able to pull some nice bluegill and pumpkinseed out of the thickest weeds while the sun was at it’s peek. Fortunately for us the fish stayed close and slid only 20-30 yards away from the “area” we had settled in. As the sun got lower in the ski and the commotion let down, we noticed that the fish slowly worked themselves out of the weeds and back towards the edge of the channel. The fishing was fast times, chasing the feeding fish up and down the banks. Moving to stay on fresh and active fish, the rest of the night stayed successful with a stead increase towards dark. The bite for the last 45 minutes consisted of mainly bluegill and crappie; favoring more heavily towards crappie. As we worked through the rows of holes we found that the fish were attacking our jigs as they worked down the water column. 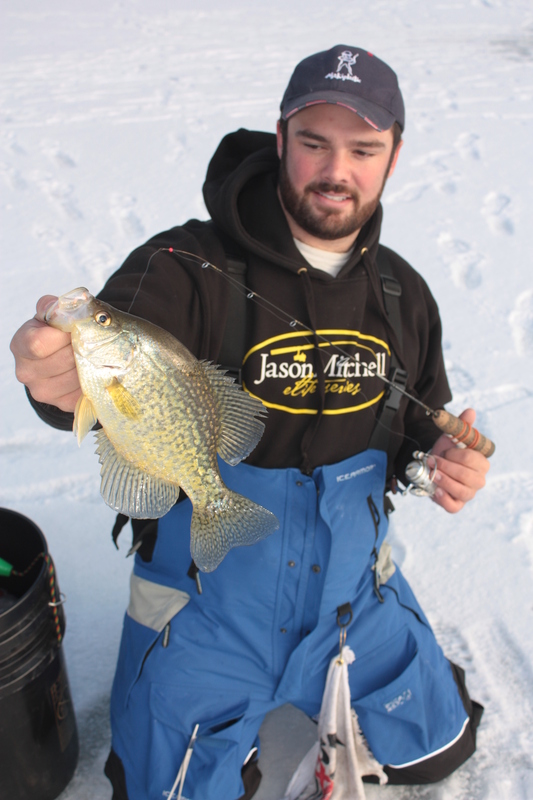 Anywhere for 2-5′ below the ice was stacked with crappie and occasionally a bluegill as you neared the weed edge. It was the time when we could do no wrong. The fish weren’t pick as long as it was moving. A run like that was the best possible way to end a nice long day on the ice! 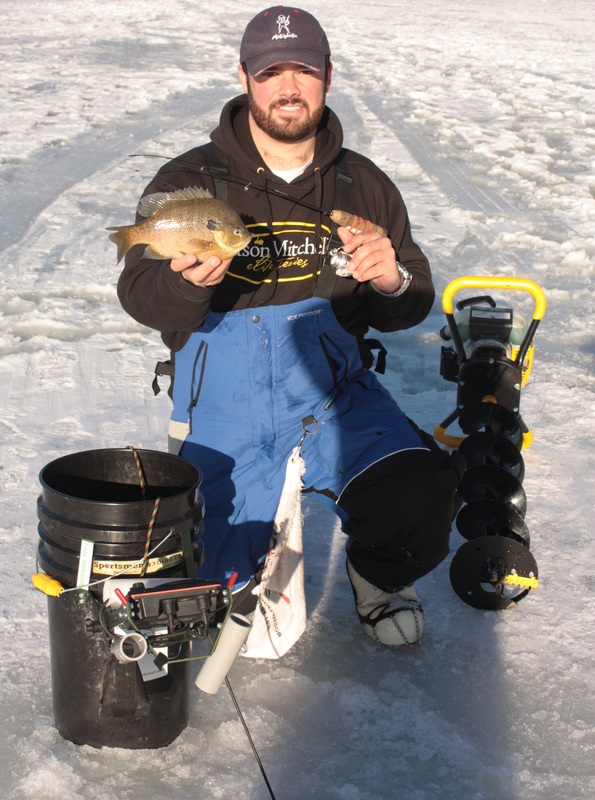 Is there any better way to bring in the new year other than with some fish on the ice? We don’t think so! We left home shortly after 7 am and over the next 11 hours we set foot on 4 different bodies of water. The first spot we got on was not good. Walking on was no issue and revealed 5″ of ice. Once out on the body of water, the amount of ice varied from the initial 5″ less than 2″ in spots that were snow covered. It was easy to read what sections of water were fine to walk on by their appearance. If it wasn’t wet or snow covered it was fine. The problem was that accessing the majority of the water wasn’t possible because of the lack of ice over the majority of the water. Unsatisfied with only catching perch, we packed up the car and headed to the second spot. We didn’t even unload our sled at the second spot. There was a few people out there but in the past we haven’t had great luck. We went out and checked the ice and talked to the people on the ice. They had been having a slow morning and needed some bait. After giving them some maggots to suffice them through the morning we watched them catch a nice sized perch before we decided to keep on trucking. The third spot was a gamble. We had no idea what we would find for ice but we went anyway. Driving up we saw pop-up shanties and tip-ups everywhere! Good news for us. We rushed out to find a good 6″ of ice. Half was black and the other was white. In spots the slush on top was deep but was able to be surpassed by sticking to past trails out that had since hardened. The walking was better than the fishing though. We punched lots of holes in all types of depth and habitats. In the end we only caught a few perch and bluegill. The fish were fairly spooky to the sound of augers and having others caught around them. With the poor fishing we packed it up once again and kept moving! The final spot we hit was the best we found all day for fish and probably the worst for ice. When we arrived we talked to a few people. Their reports were that the fishing was poor and that the ice was worse. We had to check for ourselves though as there was still people out there. The first few holes we punched revealed 3-4″ of ice but only about 1.5″ of good black ice. As soon as our baits hit the water, our minds went from a lack of ice to a lit up flasher screen! Fish were coming off the bottom to meet our presentations as fast as we could drop them. We caught crappie, bluegill, perch, and pumpkinseed. The fish were aggressive for the most part until the sun set. Although we caught crappie on the bottom the better sized fish came suspended about half way between the top and bottom. We knew it was time to go once the sun set. The wind picked up and the fish all but disappeared. With enough fish for a family friend in the pail, we called it for the day as a good welcoming for us into the new year! We are looking forward to sharing with you all! Thanks for reading! Early ice isn’t progressing as rapidly as we had hoped. Our plan was to fish a pond that we have had some success at in the past. The ice was decent minus the 10″ holes that were punched the day before and filled with anti-freeze so they would stay open. Good ethic right? Yup. Well in the end, we spent about 3 hours on the ice at this pond with very limited success. We caught a few perch, a bass, and a pike. The weeds in this body of water were causing us a lot of frustration. My underwater camera had unfortunately was died even though it read at a full charge the night before. The few holes that I checked before it died had either had no weeds and a sandy bottom or weeds so thick that your jig couldn’t make it to the bottom. Not ideal conditions yet! We packed it up with another spot in mind even thought the ice wasn’t good a few days before. Surprisingly, the spot we had hoped had ice was decent enough to hold the four of us. Punching holes through 8″ on snow revealed about 2.5″ of solid black ice. We knew our time on the ice was limited because the longer we were out there the more water the snow would absorb making the ice sag. After a little more than an hour on the ice we knew it was time to go by the sounds coming at our feet. 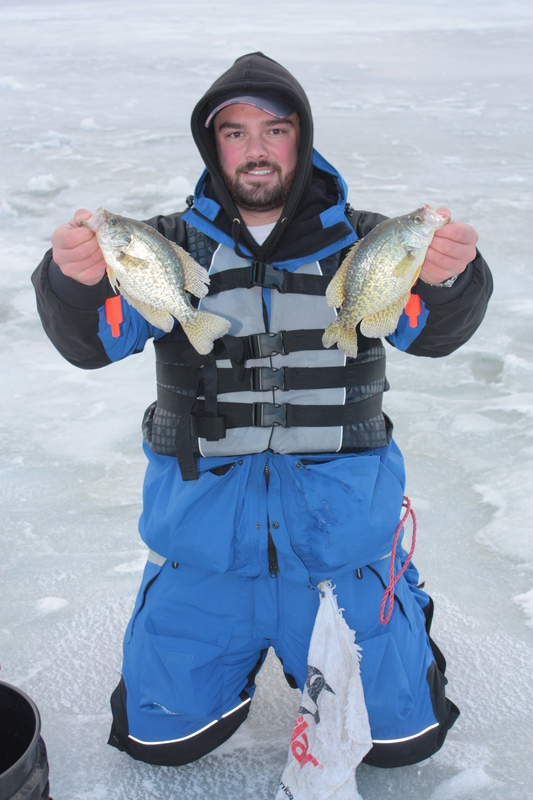 During our short stay on the ice we did manage to catch some nice fish. The majority of what we caught were pumpkinseed and bluegill but there were also some big perch and crappie mixed in as well. The fish were holding tight to the bottom in the dense weeds and most times were wiling to bite if you could find them. Although the concentration of fish wasn’t great yet they should be filtering in pretty good in the near future as they settle into their winter pattern. 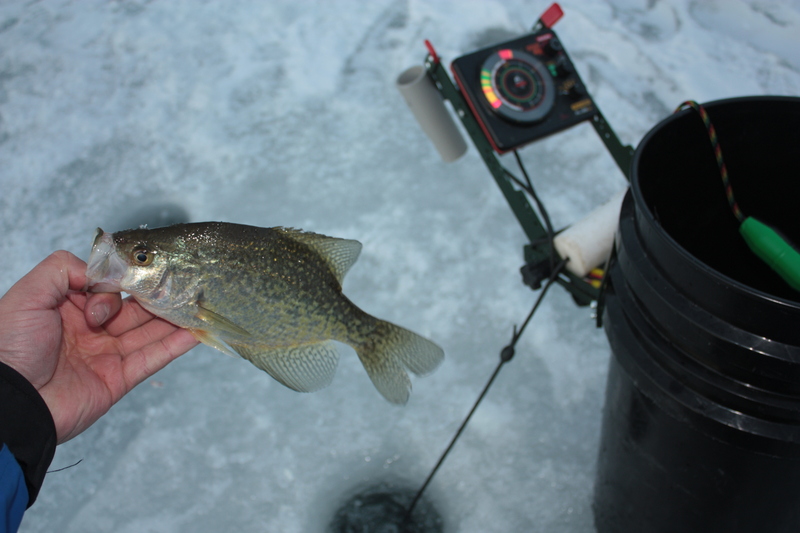 You can check out some of our Early Ice Pumpkinseed on our YouTube page! We picked one of the worst days to lug our Clam Fish Traps out on the ice. Although they came in handy as a break from the wind, which was consistently blowing in the high teens to low 20’s, the amount of slush and snow on the ice was the real downfall but more on that later. We were on a new body of water looking for deep water crappie. Our eagerness to find fish far outweighed the adverse conditions. We began out day in about 20 feet of water and it didn’t take long to get on fish. They were cruising on the bottom but willing to chase a few feet up to intercept our baits. The section of the lake we were on was covered by several inches of slush and water so moving from hole to hole was a wet nightmare. Before too long, our pant legs were covered in large balls of ice that hardened in the wind. Luckily for us the fish were biting. 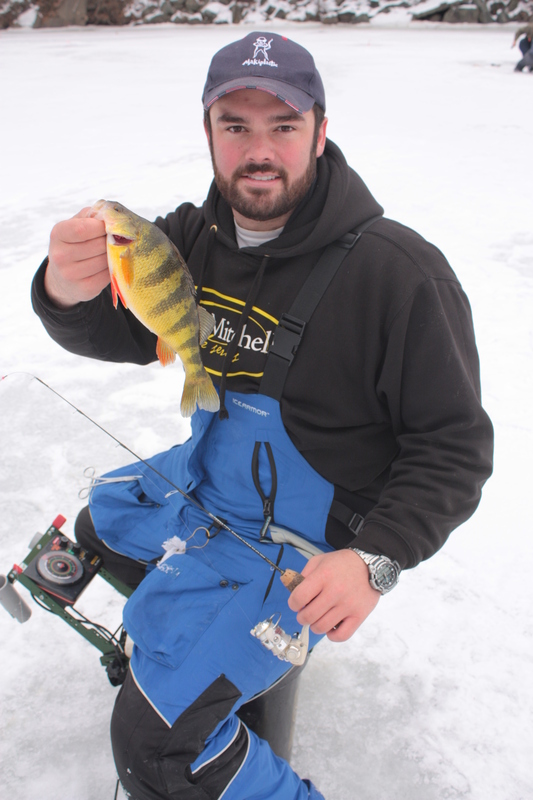 Most of what we were catching were dink perch with the occasional crappie mixed in. Knowing that there was deeper water nearby Bobby grabbed his auger and started to move out. Soon enough we were on the edge of a large 30′ basin that was surrounded by 20′ of water. As we worked the fringe of the drop off, we located random roaming pods of suspended, better sized crappie. When they came through you could pick one or two before they moved out of your hole. Not knowing the lake, the pattern of the roaming fish caused us a great deal of frustration. After they passed by, we would scatter in all directions to figure our where they went but were never were able to determine where their loop went off to. 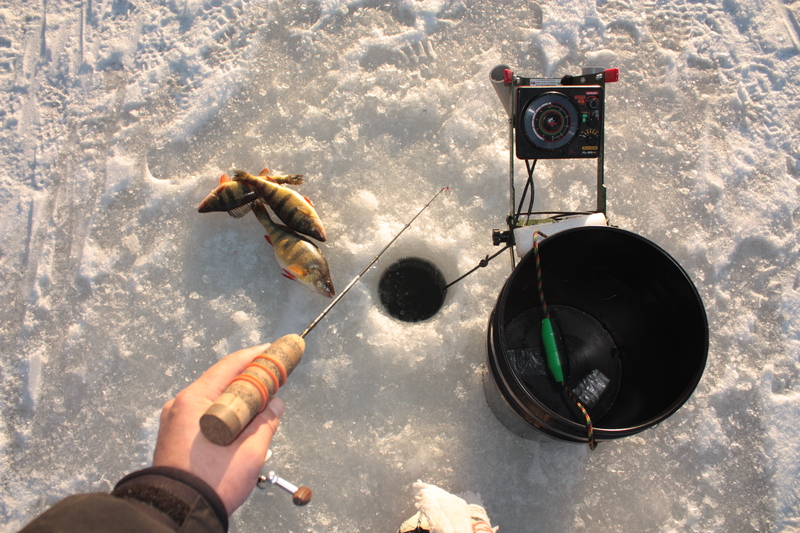 With a few fish on the ice for dinner, we packed it up to escape the wind and to check the ice at some other spots. The walk off the pond was when we really started to regret dragging out flip overs out. The wind was in our face and the snow drifts coupled with the slush that kept building up on the bottom made the walk of take twice as long as it did on the way out in the morning. The rest of our day was spent checking spots for the days to come. No safe ice was found but it wasn’t far off! There is plenty to be said about what you can learn about fish and fishing when the fish are active and aggressive, but most people don’t understand that the days when the fish don’t bite can be just as important for learning purposes. I actually find the bad days to be more productive. 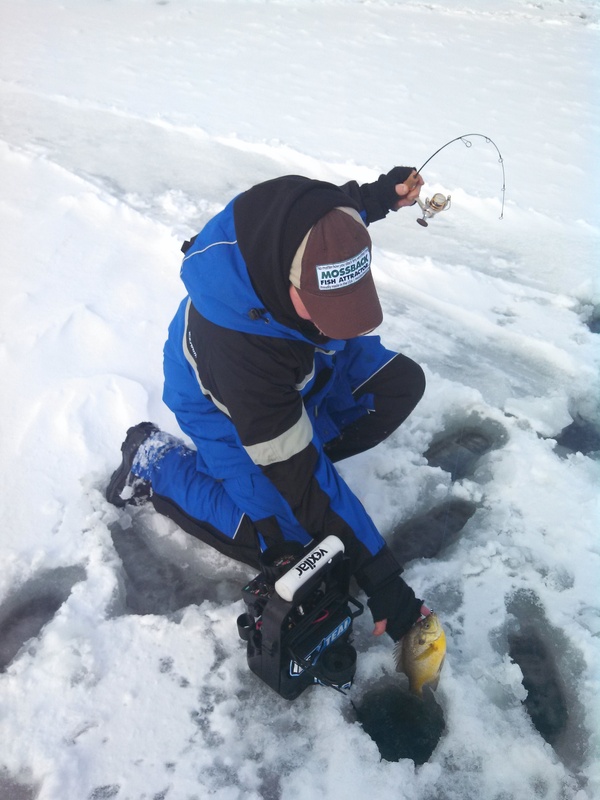 There are many things to consider when on the water/ice in terms of understanding the fish activity and their patterns; but the weather is probably the single most determining factor in having a successful day. Weather patterns, barometric pressure, wind, fronts, water temp, air temp, and consistent weather patterns all are important things to understand. For example, a steady weather pattern for a week or so will often times lead to steady consistent fishing. The periods just before a front can be some of the best fishing, but once that front hits the fish can often times disappear or completely shut off. Like any animal, movements increase just before a storm. How is this beneficial? Well for starters, look at the weather report and plan your trips accordingly. Also, the fish don’t disappear, they relocate and will potentially change feeling patterns; the best advice is to go find them. Saturday the 29th of December, left us with unpredictable weather patterns; they were changing almost constantly. Temperatures were rising and falling, along with the pressure. Snow would fly, then stop and the wind would blow, you get the point. The fishing was far from great. Another factor that we had to deal with that made things tough on this day was the fishing pressure. This element taught me something, MOVE!. There was an unusual amount of people out on the bay this day, 28 to be precise. That’s a lot of people for not a very large bay. The fish were not in there normal spots, no matter what we did we could not find the school or marks we were looking for. Looking at the tip ups, kids running around and augers drilling holes I made a big move. I grabbed the auger and the Vex and went chasing following the contour line down the shore. The further away I got from all the commotion the better fish and the more aggressive fish I found. I learned two keys things this day. Play the weather to your advantage, and fish are very sensitive to sound, so make a move. Hopefully this will helps you next time your faced with one of these disadvantages.